Updated just twice during its 16-year lifetime, we’re not sure we can wait for the next Hayabusa so we conjured up our own. 1998 was a great year for Superbikes not only did Yamaha gift us the original mighty R1 and Kawasaki deliver the ZX-9R. 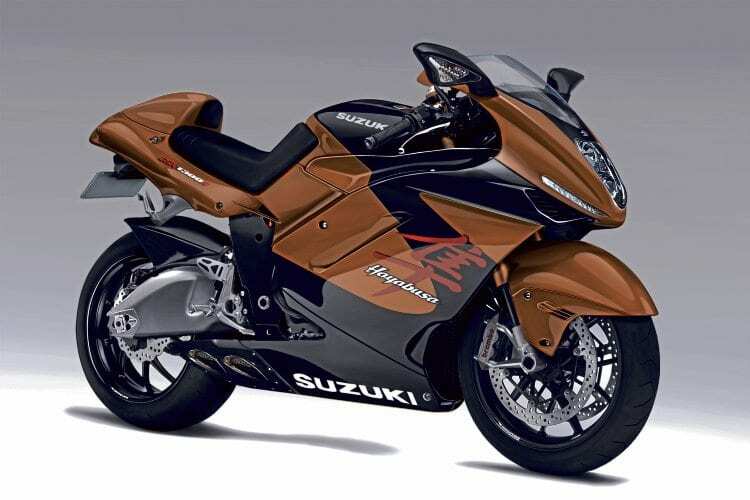 And then there’s this, the Suzuki GSX1300R Hayabusa. Designed to be beautifully ugly, it had one purpose when it appeared — to depose the Honda Blackbird as the fastest production motorcycle on the planet. It succeeded with speed to spare — while the Blackbird is but a distant memory, the Busa lives on as king of the autobahn. The first generation 1299cc Busa motor made 155bhp and had a 10 year life cycle before being superseded by the 2008 updated 1340cc powerplant. On the dyno it made in excess of 170bhp and both engines were good for near 190mph performance and sub 10-second quarter mile times. However, in the days of BMW S1000RRs and ZZR1400s making 190bhp-plus, we won’t settle for anything less than the same numbers, and preferably more. A little more stroke for a capacity hike, higher compression pistons and lighter internals should do the trick as well as boosting midrange and raising the revs. 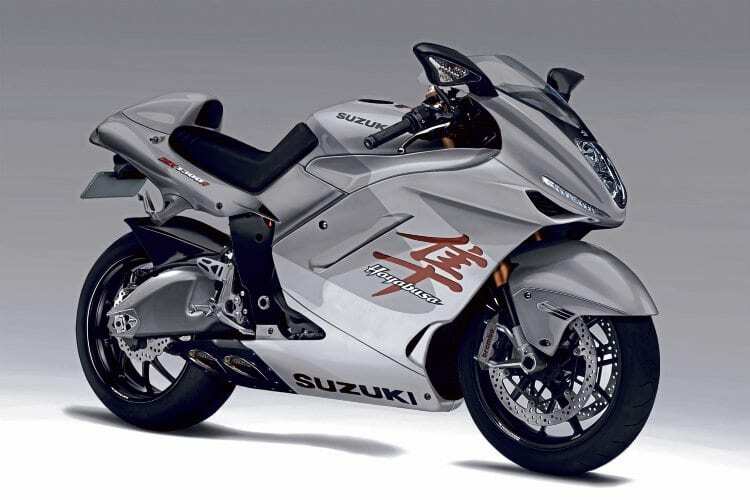 The Hayabusa was styled to look muscular and we see no reason to change it, though we have made things even more slippery in the name of aerodynamics. The all-enclosed bodywork cuts drag (the exhaust is hidden in the bellypan and even the swingarm is smooth) and slices through the air like the bird of prey it’s named after. The radiator gets an increase in capacity to keep things cool underneath the acres of plastic. The stacked headlight stays to keep the frontal area as narrow as possible but we also see new LED running lights. There’s not much wrong with the current Busa’s frame so we’ll stick with it but refined manufacturing techniques will allow us to make it lighter and stronger. So that’s good! The forks get the big piston treatment, while the rear shock is mounted horizontally to aid cooling and distribute weight more evenly. 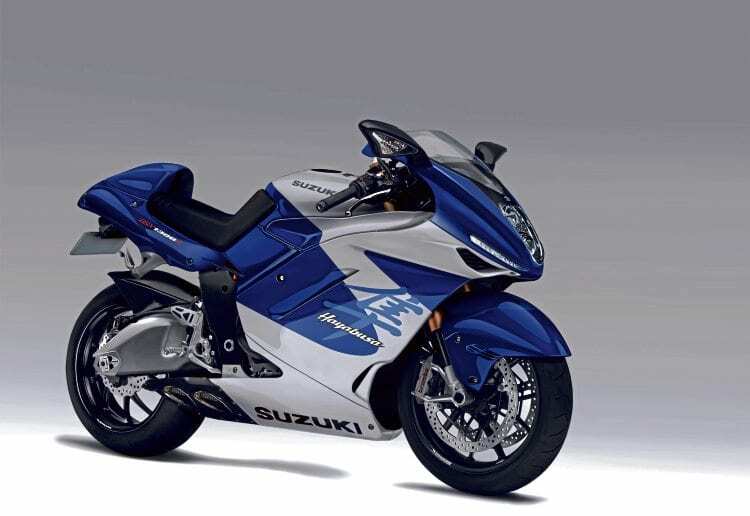 Brembo brakes are standard issue on the GSX-Rs and they’ve found their way to the Busa too. After all, you need good anchors with 200mph! Next Post:New roadster kit launched!